Why Asian Studies at Coe? Friends from Asia! During most academic years Coe has from 20 to 35 exchange students from Coe’s two exchange programs in Japan, Waseda University in Tokyo and Nagoya Gakuin University in Nagoya. These students are a great resource for Coe students who wish to study Japanese language, or have lots of friends in Japan when they do study abroad. 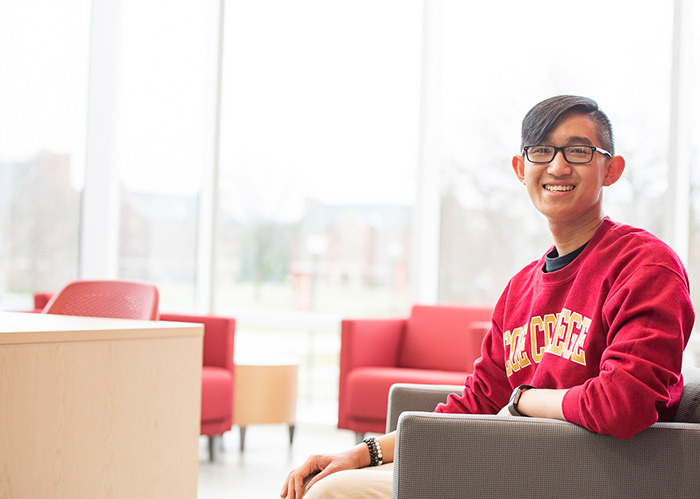 Coe also has many Asian four year international students and one year exchange students from countries like China, Korea and Nepal and a very active international club. You will be ready to travel the region upon graduation! Affordable study abroad opportunities! Students can study (in English) for one semester, or for one year, at universities in Japan, South Korea, China, Thailand and Vietnam. Direct exchange programs cost no more than a semester or year at Coe, save for travel to the host country. Moreover, Coe financial aid is fully transferable for these programs. Coe also has its own semester study abroad experience called Asia Term. For an extra fee, students can spend a spring semester in Asia under the supervision of Coe faculty members. Locations vary, but usually involve long visits to Thailand and Vietnam. Students can also have opportunities to travel to Asia with Coe faculty members to take courses during May Terms in Asia. Students receive a free credit for the first of these course and pay only travel expenses. In recent years faculty have taught May Term courses in Thailand, Vietnam, Korea and Japan. Since 1989 Asia has consistently been the most economically dynamic part of the world. In its first decade, Asia Pacific Economic Cooperation Member Economies generated nearly 70 percent of global economic growth and the APEC region consistently outperformed the rest of the world, even during the Asian financial crisis. Asia includes some of the world's major sources of conflict (for example in Kashmir, Afghanistan, the Taiwan Straits, the South China Sea and the inter-Korean border). A number of Asian states have a nuclear capability. Asian countries have always played a major part in the working of the UN and iconomits various bodies. Asia has had an impressive history that has fascinated those of us in the West since the days of Marco Polo. For most of ancient, medieval and early modern history, the largest cities, the longest life expectancies, the highest rates of literacy and the highest level of scientific achievement often were found in Asia. Asia is home to many of the world’s great religions including Buddhism, Daoism and Islam. Confucianism is, and has been, one of the world’s most influential schools of philosophy. Pop Culture! More and more Coe students have become fans of the music, film, television, literature, manga and anime, most headquartered in Asia. Coe has an active Otaku club. Asian culture in America has become more pervasive and Asians' acclimation more complete than that of other immigrants. Whether it is the culture that has become more accepted and fascinating to Americans or the individuals themselves have better acclimated to American culture is examined in Contexts magazine (Winter 2004). The Asian studies major is designed to acquaint students with the great cultures and societies of Asia, and with the region of the world that is driving economic growth. The major is interdisciplinary and encourages students to take courses in the areas of art history, foreign language, economics, history, literature, political science and religion. Travel and intensive study in the region is an integral part of Coe's Asian studies program. Justine Arcand ’17 graduated with a double major in film studies and Asian studies, with a minor in creative writing. During her time at Coe, she was a Writing Center consultant, English as a Second Language (ESL) tutor, member of International Club, member of Mortar Board and participated in Coe’s Asia Term. She received a prestigious Fulbright English Teaching Assistantship grant to teach in South Korea.